The city of Kazan is also known as the Eternal City of Russia. The reason is not only in the number of hills on the left bank of the Volga river modern Kazan is standing on. Look at the coat of arms of Tatarstan republic. The coat of arms of Russian Tatarstan republic consists of winged snow leopard with round shield sideways. The front right pad is uplifted. The sun's disk is a background. Tatar people national ornamental pattern is framing the whole composition. The inscription means "Tatarstan" . The wings of snow leopard consist of seven feathers, the shield rosette consists of eight petals. The colors of Tatarstan republic coat of arms are the colors of Tatarstan national flag. The central form of Tatarstan coat of arms is winged snow leopard - the ancient deity of fertility, the protector of kids. In the Tatarstan coat of arms - the protector of Tatarstan republic people. The sun is an ancient deity of various nations. Red sun on the Tatarstan coat of arms means success, life and happiness. The round shield is the symbol of law, power and economics. The shield aster flower with even number of petals means the source of eternal life and longevity. The uplifted front right pad of the snow leopard is the traditional heraldic gesture showing the greatness of supreme power. It also means the beginning of motion. Three golden ring shape the Tatarstan coat of arms on three levels. The mean the ideas of unity, infinity and perfection. Golden color - the symbol of elegancy, beauty, wealth of Tatarstan land. Green color - the symbol of spring, Tatarstan rebirth. White color - the symbol of purity of Tatar people thoughts. Red color -the symbol of maturity, energy, power and life. There is a legend about this beautiful winged snow leopard depicted on the Tatarstan republic coat of arms. The legend says that a snow leopard found an orphan and saved him from enemies. It looks like the same way as a she-wolf raised the founders of Rome - Romulus and Remus. And here look at Kazan city coat of arms. The modern description of Russian city of Kazan coat of arms: "The black dragon with dark red wings and tongue, golden pads, claws and eyes crowned golden coronet in the silver field on the green land. The shield is crowned with Kazan cap." The dragon is the symbol of creation and the power that helps people. The dragon has supernatural power. The dragon also symbolizes might, greatness, life, light, wisdom, invincibility, immortality and eternal rebirth. The arrow styled tongue means impulse, swiftness and purposefulness. The green land is the keeper of life and wealth, the symbol of life. The coronet is the symbol of an advanced stage of development. 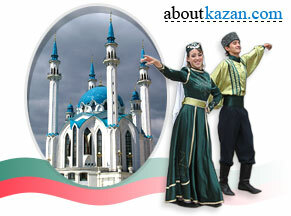 Kazan cap means the status of Kazan city as a capital of territory and Kazan city ancient traditions. Green - the symbol of spring, joy, hope, nature, prosperity, stability. Gold - the symbol of wealth, greatness, constancy, solidity, strength, generosity, intellect, intuition, sun light. Silver - the symbol of perfection, nobility, peace. Dark red - the symbol of bravery, spirit, fearlessness, maturity, energy. Black - the symbol of sense, wisdom, honesty, humility.